This morning, we brought you news of Kia's newest entry in the compact market. This afternoon, Kia revealed its all-new 2010 Kia Forte econobox warrior. With the 2010 Forte, Kia is continuing its makeover that started with the Kia C'eed and has continued with the Soul. No longer content to put out bare-bones, low budget transportation appliances, Kia is moving upscale (relatively speaking) and taking aim squarely at the head of the class; namely, the Honda Civic and Toyota Corolla. The interior materials are astoundingly tolerable, the list of standard features is long, and the amount of horsepower is high. Kia also revealed plans to build 50% of their cars in the United States by 2013. Take the badge off and you could have a respectable car. CHICAGO, Feb. 11, 2009 – On the heels of announcing the widely acclaimed, all-new Kia Soul, Kia Motors America (KMA) today introduced the all-new 2010 Kia Forte (pronounced for-tay) compact sedan at the 2009 Chicago Auto Show. Forte blends Kia's exciting new design direction under the tutelage of Peter Schreyer, Kia Motors' chief design officer, with a multitude of standard features. 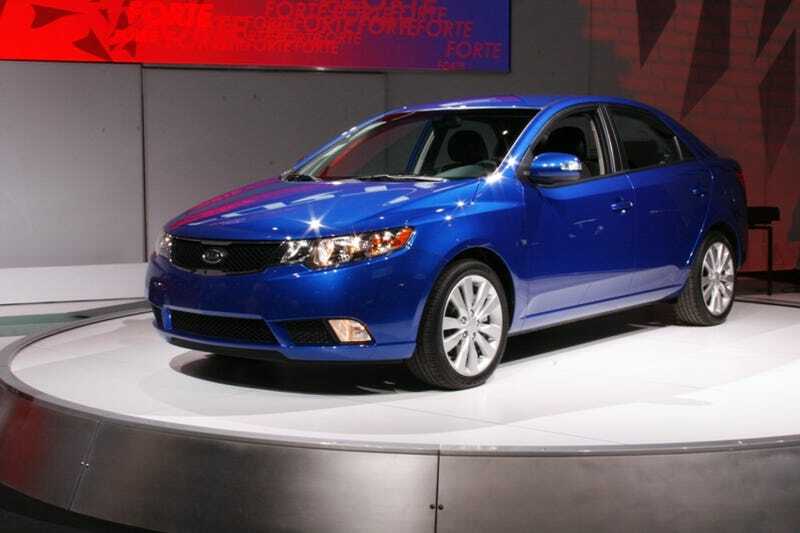 The 2010 Kia Forte will go on sale in North America in late spring or early summer of 2009. Forte boasts a class-leading¹ 96.8 cubic feet of passenger volume, while driver and passengers have an impressive 40.0 inches of headroom and 43.3 inches of legroom in the front seats and 37.8 inches of headroom and 35.0 inches of legroom in the rear seats. Forte's trunk also offers an impressive 14.7 cubic feet of cargo space, one of the largest in its class, perfect for luggage for weekend getaways. Forte LX and EX are powered by a 2.0-liter DOHC four-cylinder engine, producing 156 horsepower and 144 pound-feet of torque, that features Continuously Variable Valve Timing (CVVT) and multi-port electronic fuel injection, both of which provide for greater performance and fuel economy. The SX features an upgraded 2.4-liter inline four-cylinder engine, also with CVVT, which delivers 173 horsepower – more than the most powerful versions of the Toyota Corolla¹ or even the 2010 Mazda3. Forte comes with a standard four speaker AM/FM/CD/MP3 audio system outfitted with SIRIUS Satellite Radio capabilities with three months complimentary service². Standard on all models is an auxiliary audio input jack and USB port for connecting personal MP3 players. Standard Bluetooth® connectivity enables hands-free operation for compatible cell phones. For true audiophiles, the EX and SX packages also add a standard six speaker surround audio system and steering wheel controls. Like all Kia models, Forte is covered by a comprehensive warranty program, which offers unprecedented consumer protection. Included in this program are a 10-year or 100,000-mile limited powertrain warranty, a five-year or 60,000-mile limited basic warranty, and a five-year or 100,000-mile anti-perforation warranty. A five-year/60,000-mile roadside assistance plan is also part of the comprehensive coverage program. Kia Motors America offers a dynamic and diverse product line of 11 vehicles to meet the needs of all lifestyles. The 2009 vehicle line features the functional Rondo CUV and award-winning Sedona minivan along with a wide variety of popular passenger cars, including the refined Amanti full-size sedan, purposeful Optima midsize sedan, versatile and compact Spectra and Spectra5, and sporty yet fuel-efficient Rio and Rio5 subcompacts. The vehicle line also features the affordably luxurious Borrego, rugged Sorento and value-packed Sportage SUVs. The 2010 Soul will further complement the lineup when it arrives in dealerships this spring.